Discuss the significance of selecting structural systems for multifamily housing buildings in regard to fire safety, cost, and comfort. 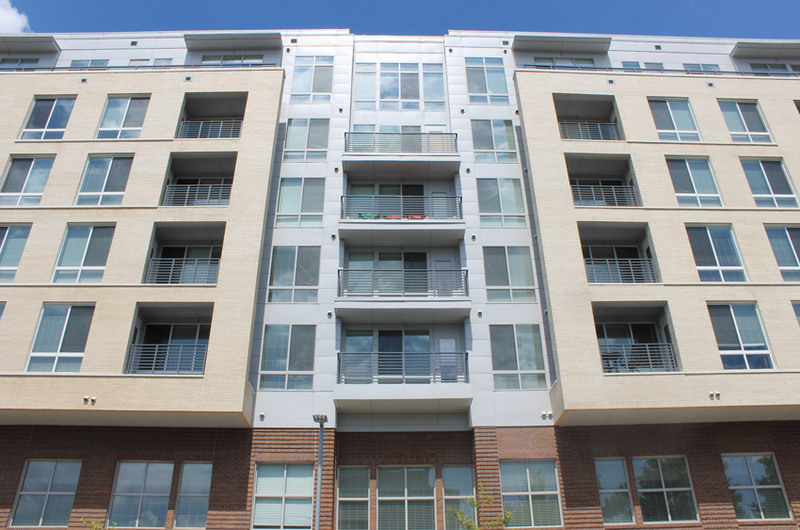 Assess the choices in exterior cladding to create multifamily buildings that create well-designed facades while assuring durability and cost effectiveness. Explain the importance of providing integrated and continuous air- and water-resistant barriers in multifamily housing. Determine ways to select appropriate hardware systems for multifamily settings that assure security and proper access. Multifamily housing continues to be a building type that is providing a significant part of the overall design and construction work in 2018. A review of industry and trade publications continues to point out that all of this activity is being driven by market demands, fostering innovative design, and making notable social and economic impacts. Multifamily housing continues to be a significant part of the overall design and construction activity in the United States, such as the Metropolitan Columbia building in Columbia, Maryland, shown here. The market for multifamily units has continued to be strong. An independent study reported by RENTCafe.com indicates that between 2010 and 2015, the United States saw an increase of 9.4 percent in the share of renter households, bringing the 2015 percentage of households that are rented (versus owned) to 36.2 percent. Some of this growth can be attributed to shifting preferences, particularly among the baby boomer generation that is looking to downsize and the millennial generation that is looking to rent or buy multifamily units. Developers are picking up on these trends and providing amenities that appeal to each of these demographic groups with pricing and packaging options suited to the market. In Vancouver, British Columbia, a city known for its plethora of recently built high-rise multifamily buildings, Pritzker Prize-winning architect Shigeru Ban is bringing innovation and sustainability together beautifully. The 232-feet-tall Terrace House has recently received official approval to use exposed mass timber in the top seven stories of the 19-story building. This approval from the Chief Building Official’s Office means that Terrace House will be the tallest hybrid wood structure approved for construction anywhere in North America. According to the Vancouver Sun, “The new building has been designed as a tribute to its neighbor Arthur Erickson’s Evergreen building. Triangular shapes, natural materials, and terraces are used to connect the two designs.” Ban’s design uses innovation and design to maximize natural light and connect indoor and outdoor environments. In terms of impacts on the localities, industry analysts such as CBRE Econometric Advisors have reported that as of December 2017, nearly 23 percent of all multifamily housing units under construction in the United States are being built in urban cores. While that is good for density, it also appears to be good for stable rental rates. The same firm reports that rental growth in urban markets has only risen about 0.5 percent in the prior two years compared to suburban markets where the rent growth has been nearly 3.5 percent in the same time period. With all of the above trends and influences in mind, we will look at four different but significant architectural building systems related to the design and construction of multifamily housing. Each one will be examined based on the ways it can be used to provide more innovative design, influence the local market, and provide residents with an attractive, comfortable, and desirable housing option. Multifamily projects usually require multi-floor construction. Determining the best type of multi-floor structural system to use for a particular project involves a review of the project needs compared to the range of available construction options. Making the most informed decision on which system to use is often a collaborative effort between architects and structural engineers, but increasingly they can benefit from talking with the technical assistance teams of system suppliers and manufacturers too. An advantage for the design team in this approach comes in the form of assistance in the selection of a building system that will not only excel in design intent but also holistically take into account the set of related issues, such as material costs, erection costs, and project timelines effects. The most common structural systems used in multistory construction are based on either concrete or steel, a combination of the two, or even combinations with wood in some cases. The selection is typically determined by the specific criteria and needs of a given project not only for structural strength but also for fire safety, sound separation, and coordination with other building systems and finishes. Some of those criteria are dictated by code and safety concerns and others by comfort and marketing issues. To address all of those, one approach that is gaining in popularity is a “thin-slab” composite floor system. Fundamentally, this hybrid system is based on using engineered steel decks and poured concrete acting together to create a long-span floor that requires fewer intermediate supports. As such, it can be a more economical, yet high-performing system to consider. It can also optimize multistory construction since the floor-to-floor heights may be reduced. This occurs because the structure spanning between load-bearing walls or beams is only comprised of the composite slab without the use of additional joists, trusses, or girders. In some cases, an additional building story may be possible using a long-span composite floor system compared to a conventional steel or reinforced concrete structure. This is particularly true in locations where the overall building height is limited due to zoning requirements. An added story means more income for a building owner and may improve the overall project financial picture considerably. Long-span composite floor systems are available in different deck profiles and a variety of depths. The steel supporting deck can be low profile and integrate with virtually any beam (e.g., wide flange, low-profile composite steel, or concrete beam) or bearing-wall method. On top of the deck, monolithically poured concrete finishes flat so it eliminates the need for grouting and floor leveling activities. Together, this system blends the speed and versatility of steel with the performance and durability of concrete in a system that can weigh up to 40 percent less than comparable cast-in-place (CIP) concrete floors. In a typical multifamily layout, the composite floor system can allow spans from the exterior walls to interior corridor walls or beams, thus reducing design coordination and construction costs associated with intermediate load bearing walls between residences. For example, a long-span composite floor system can achieve open bays up to 1,200 square feet, with clear wall-to-wall spans up to 36 feet without intermediate support columns. For longer spans, a support column can be thinned to half the size of equivalent reinforced concrete columns. Thin-slab floor and roof designs also align with LEED v4 because they support a holistic, long-term view of project performance and costs, both to the building owner and to the environment. Among the other characteristics of long-span composite floor systems, fire resistance ranks high with ratings available up to 4 hours—particularly relevant in urban settings. Similarly, concerns over vibration or acoustical control can be addressed quite predictably with design and fabrication options available to meet those demands in multifamily living. From a construction coordination standpoint, flush spandrel beams can be incorporated for glass curtain walls to be connected and properly integrate with the overall building structure. There are also standardized methods for dealing with mechanical, electrical, and plumbing components. In some cases, the corrugations in the steel deck can provide continuous channels to run and/or conceal piping, wiring, conduit, etc. In other cases, specific means for through-floor penetration of these items can be incorporated. One of the benefits of the exposed structural steel deck is that it can serve as the ceiling of the unit below the floor. Architectural finish options are available to allow for streamlined, attractive, finished appearances, or a factory-applied primer can be selected allowing unlimited paint options. In other cases, a finished ceiling treatment can be applied to the underside of the steel deck with any design characteristic desired. Overall, long-span composite floor systems can be an ideal floor structure solution for multifamily buildings. Optimized floor-to-ceiling spaces and heights are a distinct advantage of a thin-slab, long-span composite floor system used in many modern multifamily buildings. As seen here, the exposed steel deck can also serve as an attractive ceiling for the unit below and can easily integrate MEP components. The Project: This 326-unit, seven-story project in a historic but very up-and-coming part of Houston offers studios, one-, and two-bedroom units ranging from 627 square feet to 1,427 square feet. As part of the attractive amenities that enhance a sense of community and luxury, it also features a fitness studio with virtual exercise classes, conference center, resident lounge, game room, dog spa, and lower level on-site parking. The Challenge: Since space and a sense of openness including 10-foot-high ceilings were important design considerations, the structural system was foremost on the designers’ minds from the outset. A common approach to floor design is the use of 3-inch steel deck, providing 13- to 14-foot spans. However, this method could not meet the 21-foot unsupported spans requirement for the project without increasing slab heights—thicker slabs would have resulted in added building height and material costs. To answer the design challenge, the architects worked early on with a steel supplier and their engineering team. Together, they recommended a long-span composite floor system, featuring a composite dovetail 2-inch steel deck profile with poured concrete on top. This system created narrow floors that extend unsupported up to 28 feet wall to wall. Living spaces were freed up by open spans and more space-efficient floor-to-ceiling heights. The Solution: The support structure for the project uses cold-formed steel load-bearing walls. With the walls and shoring in place, the dovetail floor panels were set, screwed onto the bearing walls, and the concrete was poured—all ahead of schedule. The construction was further streamlined since long-span composite systems are UL fire-endurance rated for 2 hours without additional spray-on or gypsum materials. Therefore, unlike traditional steel decking, fireproofing to meet code requirements was achieved without special drywall work or filling the deck flutes with fire-retardant material. By staggering the dovetail deck flutes when placed on the walls, smoke and fire cannot breach the head of the wall because it runs into solid concrete. The Result: This project exemplifies how the right steel building system can provide the desired design intent, improve space planning, streamline construction, and cut costs. The long-span composite floor system created thin floors that span unsupported up to 28 feet wall to wall. Living spaces were maximized by open spans and space-efficient floor-to-ceiling heights. Thin floor slabs reduced overall building height and related building material costs. Convenient, reliable, and secure for both property and resident, Mobile Access Solutions is a secure, end-to-end mobile credential application utilizing Bluetooth Low Energy (BLE). This state-of-the-art technology securely issues and updates digital credentials on smartphones, tablets, smartwatches, etc. Using LEGIC Connect technology, these credentials can be used on mobile-enabled locks, providing residents access to an apartment’s main door, individual unit, or amenities. Versa-Dek® composite deck products utilize the inherent strength and aesthetic appeal of the dovetail shape in both 2- and 3.5-inch profiles to provide architectural and structural design communities a vast array of composite floor and roof deck options. These versatile structural solutions can be specified with acoustical options. XtremeTrim® is a line for various siding products from fiber cement to T&G cedar, with multiple options in reveals and profiles ranging in sizes from 5/16 inch to 2 inches. XtremeInterior™ is a line of unique and contemporary details for drywall applications and the ability to create custom extrusions. We are in the business of providing the design community with solutions. For a streamlined approach to controlling water, air, and thermal bridging, ZIP System® R-sheathing provides structure plus built-in continuous foam insulation, a rigid air barrier, and a water-resistive barrier. Available in multiple insulation thicknesses, ZIP System R-sheathing is an efficient way to increase exterior R-value for projects in any climate zone. Learn more at InsulateYourBuild.com.